L'ICE dei federalisti (ossia la prpposta politica federalsita alla Commissione Europea nell'ambito dell'istituto "ICE", che l'acronimo di "Iniziativa dei Cittadini Europei") non è passata perché non ha raggiunto il milione di firme nel tempo richiesto (di un anno). Ma, come ho già detto a suo tempo, ha avuto ugualmente degli effetti positivi. Con lo stesso nome ND4E (= New Deal for Europe) c'è ora in ballo una petizione al parlamento Europeo. Essa ha avuto il sostegno di 75 deputati europei (in un insieme davvero trans-partisan, che comptrende deputati di ogni stato-membro e diversi schieramenti politici, dal centro sinistra al centro destra). Stasera alle 17 si può vedere in diretta la discussione in PE della petizione "ND4E" al Parlamento Europeo. Ho ricevuto a proposito due e.mail. in diretta o in differita il giorno successivo. Sign our petition to the European Parliament ! Breaking news: next meeting of EP Committee on Petitions (20 June 2016) will be broadcast in webstream. As already announced in our previous newsletter on Monday 20 June 2016 at 17:00 the Committee on Petitions of the European Parliament (EP) has put on the agenda the discussion of our petition in the presence of MEPs belonging to other Committees, the European Commission and the petition promoters. Lucio Levi, first ND4E petitioner, will present our demands. You can watch at 17:00 live or recorded the next day. With a simple tweet/retweet you can stimulate the European deputies that support our campaign and help the positive result of the discussion about ND4E petition in the Committee on Petition. In order to help your action you can find the list of 75 MEPs supporting ND4E. If you click on the name you will be linked to a tweet addressed to the MEP's twitter account. Once you are on the tweet page you can simply retweet the message and/or like it. Clara AGUILERA GARCÍA, Margrete AUKEN, Georges BACH, Brando BENIFEI,Pervenche BERÈS, José BOVÉ, Mercedes BRESSO, Renata BRIANO, Soledad CABEZON RUIZ, Enrique CALVET CHAMBON, Jean-Marie CAVADA, Nessa CHILDERS, Richard CORBETT, Silvia COSTA, Michael CRAMER, Nicola DANTI,Marielle de SARNEZ, Karima DELLI, Mady DELVAUX-STEHRES, Jean-Paul DENANOT, Pascal DURAND, Frank ENGEL, Jonás FERNÁNDEZ ÁLVAREZ, Knut FLECKENSTEIN, Doru FRUNZULIKA, Elena GENTILE, Michela GIUFFRIDA, Charles GOERENS, Ana M. GOMES, Sylvie GOULARD, Karoline GRASWANDER-HAINZ, Roberto GUALTIERI, Sylvie GUILLAUME, Yannick JADOT, Ramón JÁUREGUI ATONDO, Eva JOLY, Eva A. KAILI, Sylvia-Yvonne KAUFMANN, Ska KELLER, Miapetra KUMPULA-NATRI, Cécile KYENGE, Alain LAMASSOURE, Philippe LAMBERTS, Jo LEINEN, Javi LÓPEZ, Juan Fernando LÓPEZ AGUILAR, Curzio MALTESE, Ernst MARAGALL, Martina MICHELS, Alessia MOSCA, Norbert NEUSER, Maria NOICHL, Ioan Mircea PASCU, Vincent PEILLON, Georgi PIRINSKI, Gianni PITTELLA, Viviane REDING, Terry REINTKE, Michèle RIVASI, Virginie ROZIERE, Elly SCHLEIN, Joachim SCHUSTER, Birgit SIPPEL, Renato SORU, Barbara SPINELLI, Bart STAES, Dario TAMBURRANO, Mark TARABELLA, Patrizia TOIA, Claude TURMES, Ernest URTASUN, Guy VERHOFSTADT, Daniele VIOTTI, Gabi ZIMMER. The same result can be obtained with a similar action using your Facebook profile. With a simple action you can help ND4E campaign. 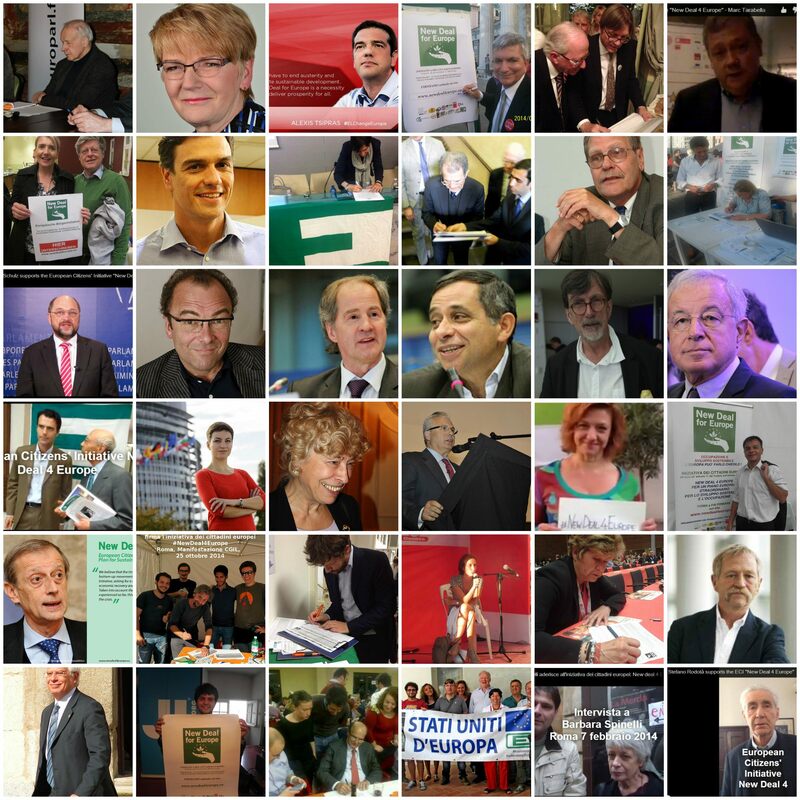 In order to help your action here you can find the list of 75 MEPs supporting ND4E. If you click on the name you will be linked to their facebook profile. Once you are on the MEP profile simply add a comment to the last message as explained before. Clara AGUILERA GARCÍA, Margrete AUKEN, Georges BACH, Brando BENIFEI, Pervenche BERÈS, José BOVÉ, Mercedes BRESSO, Renata BRIANO, Soledad CABEZON RUIZ, Enrique CALVET CHAMBON, Jean-Marie CAVADA, Nessa CHILDERS, Richard CORBETT, Silvia COSTA, Michael CRAMER, Nicola DANTI, Marielle de SARNEZ, Karima DELLI, Mady DELVAUX-STEHRES, Jean-Paul DENANOT, Pascal DURAND, Frank ENGEL, Jonás FERNÁNDEZ ÁLVAREZ, Knut FLECKENSTEIN, Doru FRUNZULIKA, Elena GENTILE, Michela GIUFFRIDA, Charles GOERENS, Ana M. GOMES, Sylvie GOULARD, Karoline GRASWANDER-HAINZ, Roberto GUALTIERI, Sylvie GUILLAUME, Yannick JADOT, Ramón JÁUREGUI ATONDO, Eva JOLY, Eva A. KAILI, Sylvia-Yvonne KAUFMANN, Ska KELLER, Miapetra KUMPULA-NATRI, Cécile KYENGE, Alain LAMASSOURE, Philippe LAMBERTS, Jo LEINEN, Javi LÓPEZ, Juan Fernando LÓPEZ AGUILAR, Curzio MALTESE, Ernst MARAGALL, Martina MICHELS, Alessia MOSCA, Norbert NEUSER, Maria NOICHL, Ioan Mircea PASCU, Vincent PEILLON, Georgi PIRINSKI, Gianni PITTELLA, Viviane REDING, Terry REINTKE, Michèle RIVASI, Virginie ROZIERE, Elly SCHLEIN, Joachim SCHUSTER, Birgit SIPPEL, Renato SORU, Barbara SPINELLI, Bart STAES, Dario TAMBURRANO, Mark TARABELLA, Patrizia TOIA, Claude TURMES, Ernest URTASUN, Guy VERHOFSTADT, Daniele VIOTTI, Gabi ZIMMER. - Pour la Solidarité. New Deal for Europe: L'initiative citoyenne finalement reconnue! After the hearing on June 20 the Committee on Petitions of the European Parliament (EP) has put on the agenda for the second time the discussion on our petition in the presence of MEPs belonging to ECON, EMPL and BUDG Committees, the European Commission and the petition promoters. Lucio Levi, first ND4E signatory, will present the demands of the petition asking to hold it further open up to the achievement of the proposed objectives (a European investment plan for employment, the environment and security, financed by a European tax on financial transactions and on CO2 emissions, and by a European loan in euro project bonds). You can watch live at 16:00 (9 November) or recorded the next day. SAVE THE DATE. Bruxelles, 9 November 2016. H. 16.00. Discussion of Petition 1049/2015 on the revision of the multiannual financial framework. On June 20, 2016 the Petitions Committee of the EP, in the presence of representatives of the European Commission, decided, following a proposal by the sponsoring organizations and MEPs Jo Leinen (PSE), Enrique Calvet Chambon (ALDE), Brando Benifei (PSE), to acknowledge the petition and keep it open, sending it to the labor, economic and monetary, and budget EP Commissions for a pronouncement on its content, and to the European Commission. The European Committee New Deal 4 Europe (ND4E) endorses the Rome demostration "Against Europe of Walls Let us Build Together European Democracy" that will take place on the occasion of the 60th anniversary of the Treaties establishing the European Communities. With a simple tweet/retweet you can invite the European deputies that support our campaign and help the positive result of the discussion about ND4E petition in the Committee on Petitions. In his speech on the State of the Union, President Juncker described the “existential crisis” of the Union and foreshadowed the risk of disintegration of the EU. The commitment to mend the shortcomings of the institutional architecture of the EU is complicated by the fact that a large number of citizens feel that the EU institutions do not respond to their needs. This is the reason why governments are reluctant to address the problem of the institutional reforms after the negative experience of the French and Dutch referenda on the European Constitution. We firmly believe that the best way to regain citizens' consent towards the European institutions lies in reforms within the boundaries of the Lisbon Treaty. The European Fund for Strategic Investments represents a step in the right direction, since, after years of austerity policies, it finally gives priority to growth, competitiveness and job creation. But its current financial endowment is insufficient to face not only the issues of unemployment and stagnation but also the new challenges of migration and foreign and security policy. d) the bonds that the ECB can purchase within the framework of quantitative easing. The need for new own resources in on the European agenda in the second half of this year, when the conclusion of the works of the high level group on the EU own resources chaired by Mario Monti, the revision of the Multiannual Financial Framework (MFF). The petition ND4E, that is expression of a wide alignment of European civil and political society forces, wants to underline that now it is time to act. And the European Parliament has the potential to play a crucial role to turn people's expectations into reality. The Campaign ND4E started in 2012. In 2014-15 a European Citizens' Initiative (ECI) on “A European Special Plan for Sustainable Development and Employment” was promoted and withdrawn as soon as the European Commission started the European Fund for Strategic Investments. ND4E is the only example of an ECI whose proposal has been taken in by the European Commission. But, owing to the insufficient amount of resources mobilised by the Fund, the petition ND4E is focused on the creation of new EU own resources.